Incoming from Daniel Norwood on Vimeo. 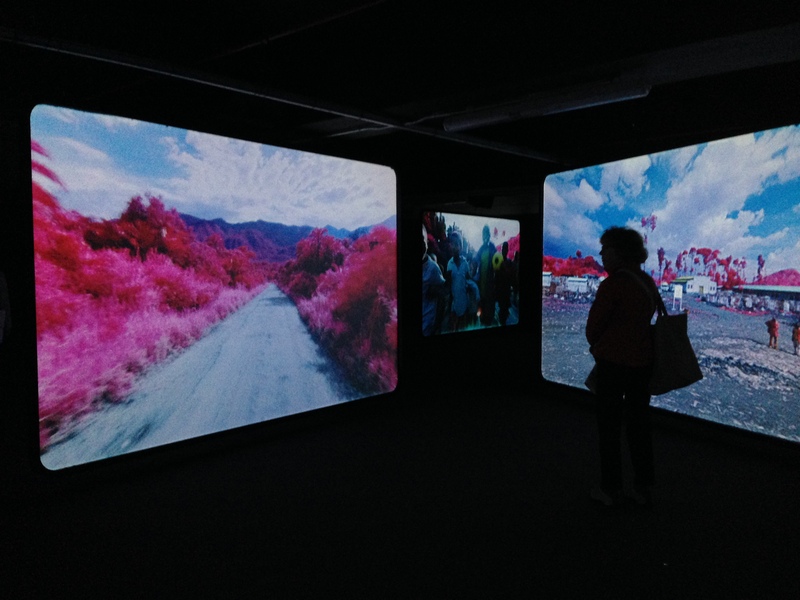 Incoming is a multi-media instillation on show at the Barbican Gallery in London by the artist Richard Mosse in collaboration with the cinematographer Trevor Tweeten and the composer Ben Frost. Its theme is the migration crisis of refugees into Europe, and branches off into independent but related scenarios such as the demolished ‘Jungle’ Camp in Calais and naval operations in the Mediterranean. Mosse uses a military grade thermal imaging camera to represent migrants as monochromatic, anonymous figures irradiating heat signatures in varying tonalities, depending on their circumstance and predicament. The thermal rays bounce off a metallic blanket like light, and the tips of fingers and the ends of noses fade against warm palms and faces. The vision of this highly sophisticated camera in this context is resolutely other: a piercing dystopian eye which sees like an alien and renders those within its gaze as heat maps, rather than identifiable individuals. 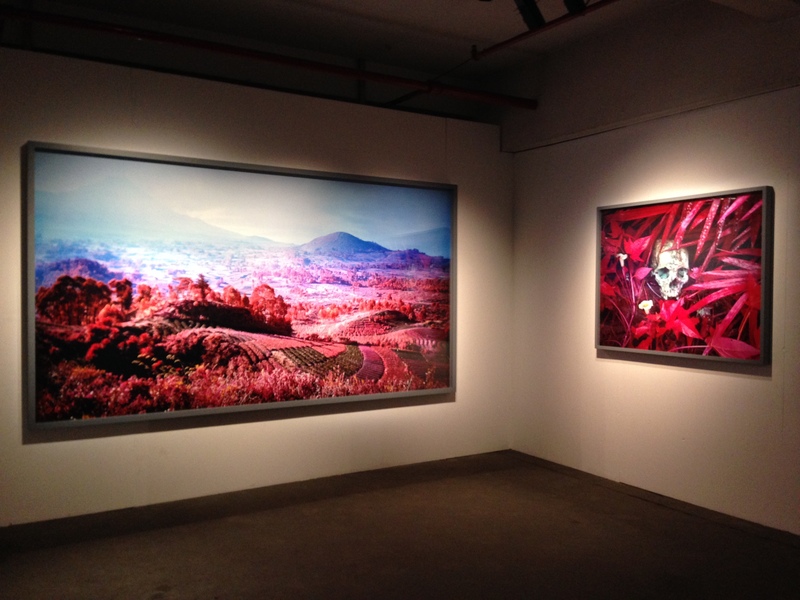 As a linear progression from his previous work Enclave, where the artist used discontinued military grade infra-red film to reveal Congolese fighters in deep jungle, Incoming utilizes the technology of surveillance as a medium of artful reflection, rather than for, as in this case, its intended purpose – as a tool for battlefield awareness or the long range enforcement of border crossings and other state sponsored surveillance. Where Incoming departs from Enclave, and expands the critique on the use of such systems, is in the insidious rendering of all human life as equally vulnerable to the camera’s technology. The ethical use of this medium is born out of the artist’s desire to diverge from the common use of images in the mass media, and showcase the awesome (it provokes awe) properties of the camera itself. In simple terms, this means that the gallery visitor can see what the soldier or law enforcement officer sees. More importantly however, it highlights the complicity of this ‘seeing’ in the context of the gallery space, and casts the unwitting witness as complicit in this crisis. The result is that one emerges into the daylight equally moved and troubled by the experience. Yes, the refugee ‘other’ is represented as stark, featureless biological traces, but so too are the aid workers, doctors, police officers and military personnel. Indeed, anyone who strays into the dehumanising vision of the all-seeing-eye is deprived of humanity. In this way, the gallery visitor, by association, is implicated in the work, and this fact could be used to respond to criticism of Mosse’s approach as mere gimmickry. The discrepancy of power relations between migrants and governments create an unnerving undercurrent, raising questions about the ethical use of surveillance techniques against people who are essentially rendered (in their essence) the same as us – just another heat source. This could be seen as helping to break down barriers of representation, rather than re-enforcing usual stereotypical narratives. However, it is complicated by the inherent sense of voyeurism – the overall production values borrow from the language of entertainment – the lingering close up and the stylized slo-mo being two obvious examples. In short, Incoming refers as much to the new frontiers of military hardware available to the State as to the vulnerable refugees that this project seeks to represent. The powerful and emotive Incoming is a free exhibition on at the Barbican until April 23rd. 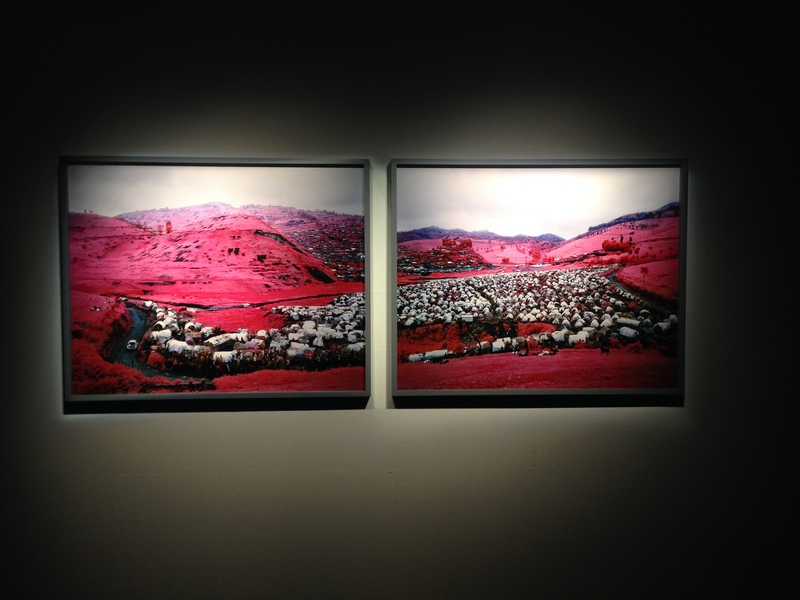 The electrostatic whine of feedback reverberating around this darkened room accompanies the crimson shades of ‘Enclave’, the photographer Richard Mosse’s latest Congo Project. Trapped in its own subterranean world – this overspill display forms part of the Deutsche Börse Photography Prize exhibition at the Photographers’ Gallery, and manifests itself as a stream of consciousness halfway between dream and reality. In this disconnected space, the curatorial process can be taken as a fundamental element to the work itself. The lack of visible light paradoxically makes the viewer more aware of their own presence while negotiating the strange hypnotic properties of the images. The inspired act of selecting (practically) obsolete military surveillance film, which renders vegetation in lurid red and magenta hues adds to the symbiotic relationship between content and context. Cast out from the pristine white walls of the gallery, these images are further removed from their documentary roots and engage more with the conceptual notions of representation – particularly with regard to our consumption of images of Africa as ‘other’ or ‘apart’ from western experience. Six bed-sheet sized transparent screens hang from the ceiling, adding to the immersive nature of the work. Onto these are projected infra-red moving images from the Congo, a place where the death toll – 5.4 million since 1998 – mirrors that of the holocaust. Much like the unfathomable extent of this tragedy, the project deals less with the specifics of the ongoing conflicts, and more with a dark psychological brew into which fact and fiction melt and dissolve. Given this universal treatment, beauty and the sublime, albeit as something of a technical construct, are never far from the surface. A languid descent of a hillside down into a refugee camp is made cinematic with the expert use of a steady-cam, before laboring, somewhat uncomfortably, on a father holding a child in the belly of the camp. This methodology is the antithesis of the Photojournalist grabbing at action, and seems to have more in common with theatre or other performative fiction. Mosse, filmmaker Trevor Tweeten and sound recordist Ben Frost, have chosen to view this troubled land through a prism in an attempt to extract some hidden truth from a story as impenetrable as the surrounding vegetation. By rendering the infra-red into the ocular range, they have managed to successfully re-frame the conflict and, in so doing, have turned technology used for warfare back in on itself to show its raw, hallucinogenic underbelly. The exhibition continues until the 22nd June.